Decommissioning Buchan Alpha at the deep-water Dales Voe base in Lerwick. Shetland’s hopes of securing a bigger slice of the multi-billion-pound North Sea decommissioning market have received a boost. A Scottish Government feasibility study showed the Dales Voe base at Lerwick was the best place in the UK to build an ultra-deep-water port for scrapping large installations. Holyrood said it would work with the UK Government and industry to get the project up and running. Shetland politicians welcomed the move and said the initiative could greatly benefit the local economy. But it is not yet clear whether Westminster will support Dales Voe’s candidacy. The UK Government has commissioned its own feasibility study into UK port facilities, but that has not been concluded. Both governments want to prevent UK ports from missing out on contracts for large-scale decommissioning jobs. Norway has an advantage because it boasts several ultra-deep harbours which provide better access for the largest crane vessels designed to lift oil platform sections. A total of £17billion will be spent on decommissioning in the UK continental shelf between 2017 and 2025, according to Oil and Gas UK. The Scottish Government previously vowed to make £7.5million available for the deep-water-port project, and challenged the UK Government to commit funding as well. Last month, Scottish Energy Minister Paul Wheelhouse said he was confident a review of all UK ports would show Scotland had the best sites. At the time, Mr Wheelhouse did not say which harbour had been chosen as Scotland’s frontrunner, but the choice was revealed in the new Programme for Government. The programme’s authors said: “We will continue to work to realise the benefits of decommissioning, advancing our commitment to provide financial support for establishing a deep water port in Scotland. 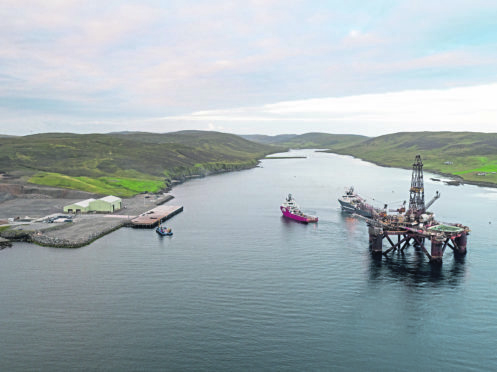 Lerwick has a strong track record of handling decommissioning jobs of various sizes and has been promoting its own candidacy for an ultra-deep facility for some time. More than 10 years ago, the huge module support frame for one of the Frigg field’s platforms was dismantled at Lerwick’s Greenhead base. The Buchan Alpha oil production vessel, operated by Repsol Sinopec Resources UK, arrived at Dales Voe for scrapping last year. A spokesman for the UK Department for Business, Energy and Industrial Strategy, said: “The North Sea supports thousands of highly skilled jobs across Britain.